The Annual Transport Festival at Bodafon fields is a wonderful and very appropriate accompaniment to the traditional Victorian Extravaganza, which is held here every year on the first week-end in May. It presents to us, for our remembrance, many very portable technological ideas, steam, petrol, diesel and electrical that first entered common usage during the Victorian era, driven largely by people whose origins were in the United Kingdom. Importantly, many were ideas that improved communication, travel and the carriage of goods across the country and across the oceans. We do well to record that when Queen Victoria came to the throne the quickest way to send a message from one end of Britain to the other was on a fast horse with a good jockey, but from one part of the Empire to the other it was even slower by sailing ship. When the first railways were built (actually in the reign of William IV) train was the quickest way to get a message (or anything else) from one place to another and it was the need to be able to signal ahead, to stop a train in an emergency, that led to the development, during the early years of Queen Victoria, of the electric telegraph and much later the electric telephone. By the end of Victoria's reign such remarkable changes had been made that even the queen couldn't fully appreciate their importance and impact, such that when Sir Charles Napier in India captured the province of Sind, his rather naughty cryptic telegram to Her Majesty "Peccavi" (Latin for I have sinned) was received by the Queen with the outburst "News of such an important victory warrants at least an officer on horseback." Those great belching steam engines, that we all passionately love and hate, quite rightly find their way into the noontide procession each day but there is a magnificent collection of preserved road vehicles that don't get nearer the centre of Llandudno than the Bodafon showground to which a frequent vintage bus service operates daily. I am very grateful to Alan Haydock, who realises that I am not very mobile these days and so I am unable easily to visit the Bodafon show ground where these great machines, now superseded by newer models of the same thing, but which have largely revolutionalised transport and also farming, hide their light under the proverbial bushel. Alan has provided some photos without which my site would be the poorer. Thank you Alan. 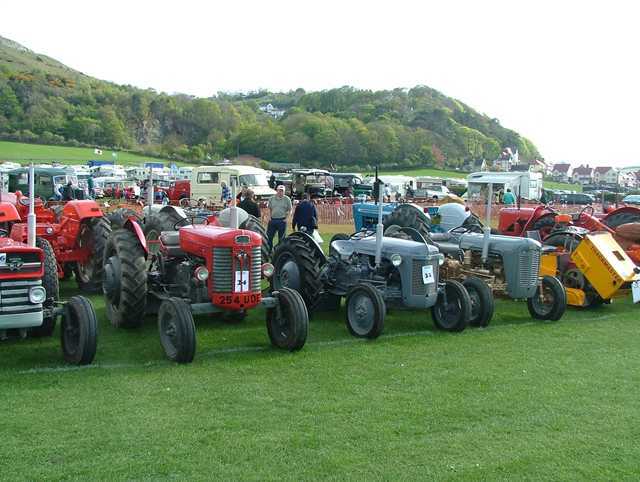 Tractor line up, two “Grey Ferguson's” plus a Massey Ferguson of later years among many. 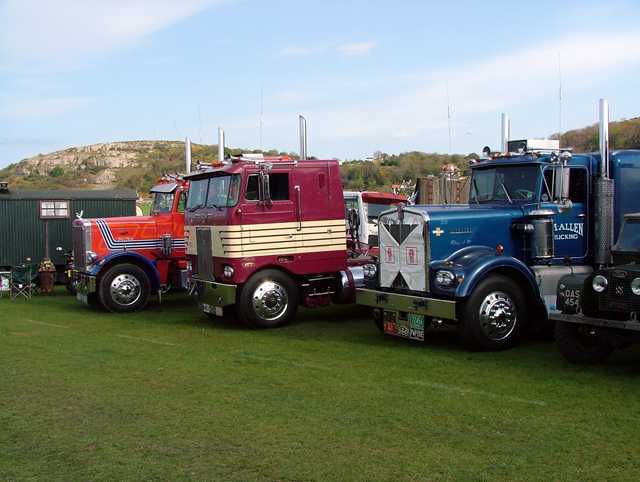 American Trucks, two Kenworths and a Peterbilt. 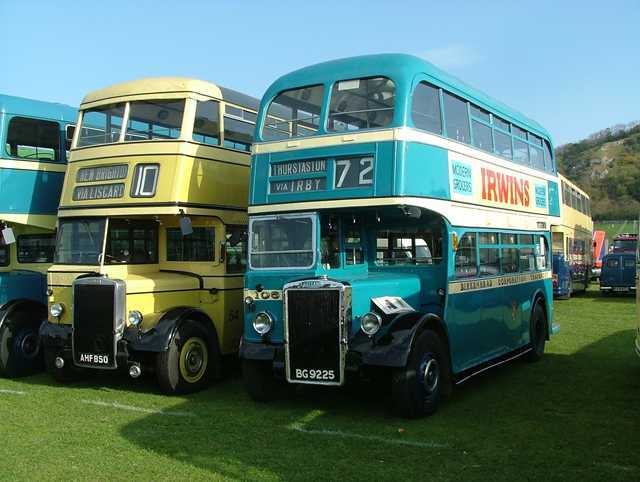 all preserved by Maghull Coaches, Merseyside. 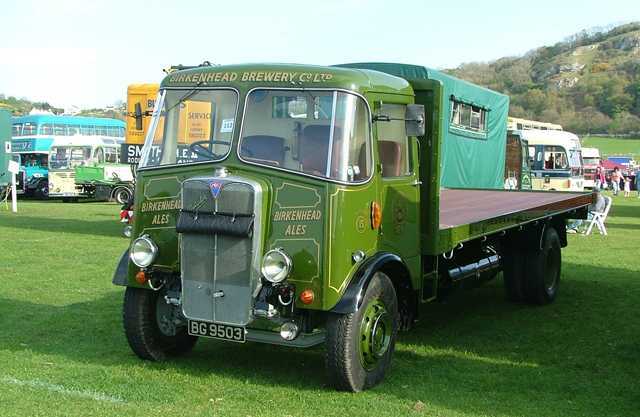 950 AEC Matador Lorry belonging to the BBC (Birkenhead Brewery Company!). 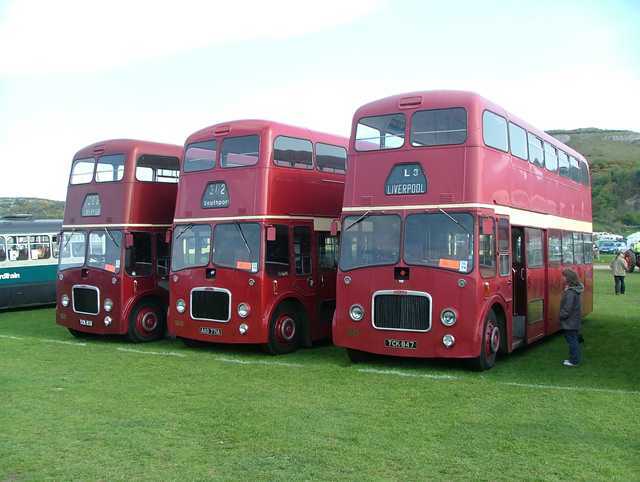 Birkenhead & Wallasey Leyland Titan double deck buses. Little & Large! 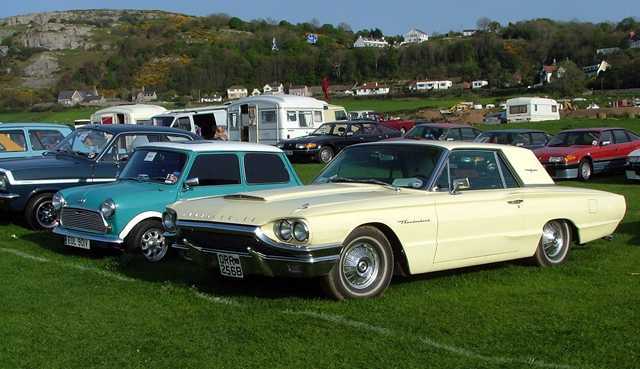 1964 US Ford Thunderbird & 1980 Mini.